Gravel. Population 47. A town rife with crime, cake, country women and corruption. With an unusually high crime rate, Gravel is policed by local crack detective Patricia Huntzenberger, five-time Gravel Easter Egg Hunt champion. Huntzenberger has solved every crime that’s come her way in her small, but crime-ridden town. All but one that is. 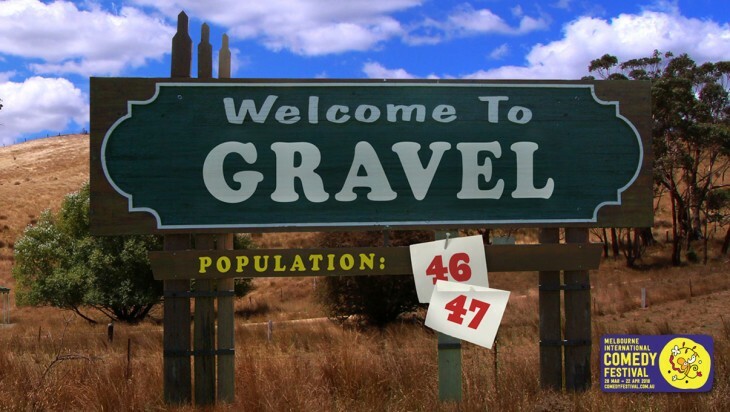 A cast of kooky characters from this little Aussie town with an enormous crime rate welcome you to Gravel. We hope you enjoy your stay, if you live that long. Following on from their success with the Monash Comedy Law Revue in 2017, Louise Howard, Ethan Katz and Vivek Thilkan are teaming up with some brand-new friends to take Melbourne by storm.